Moral force cannot be confirmed merely by ideas, it can only be forged and tempered in the workshop of action. The modern corporate world as a whole is in the process of acquiring a conscience. Concepts like business ethics and corporate social responsibility are becoming part of the main stream of thought in management theory and practice. One of the terms we hear sometimes in the current ethical debate is “integrity’’. It is perhaps a better word than “ethics” because while the word “ethics” conveys a sense of good and bad , right and wrong, do’s and don’ts, the term “integrity “ gives a sense of character, integration and wholeness. However integrity has an individual as well as a collective dimension or in other words there is something like corporate integrity, which can be regarded as one of the primary aims of corporate governance. This article examines the concept of corporate integrity and how to build it in an organisation in a holistic perspective, with a predominant stress on corporate governance. In an ethical perspective, integrity means “walking the talk” which means harmony between speech, behaviour and action. In a more psychological perspective, integrity means harmony between thought, feeling, will and action or in other words “say what you do and do what you say.” Integrity is not only individual but also has a collective dimension. Just like the individual, a collectivity like an organization also has a physical, vital and mental dimension. The physical dimension is the material structures like building or machinery and the rules and regulations which govern the material life of the community. The vital being in man expresses itself in the collective organism through the economic, social and political life of the community, like its power and wealth structures, interpersonal relationship or interactions and its systems of execution. Similarly, the collective mind of the community expresses itself through its information systems, knowledge-generating process, decision-making structures, research and development, mission, vision, values and culture. So for the collectivity, integrity means alignment of its physical, vital and mental dimensions, around a focal point of integration. For awakening the moral force in the organisation, this focal point of integration has to be an ideal which transcends the short- term interest of the organisation and embraces the larger community or society or in other words a higher ideal beyond the bottomline goals, which leads to the well-being and progress of the community. This brings us to the question how to monitor the integrity of an organisation? This is one of the main functions of the Board of Directors of the Company. Marketing strategy, technological improvements carried out, organisational structure etc. and compare them with the latest international standards or developments. The moral integrity of company means upholding some basic and universal human values like honesty, truthfulness, transparency, justice, fareness, compassion in all actions, behaviour and transactions of the company with its stakeholders like employees, customers, suppliers, government and the community or society. A performing board must keep a watchful eye on this moral quality of the organisation. Whenever or wherever there is violation or dilution in the moral fiber of the organisation, the board must act firmly to set it right. And finally, sustaining the professional and moral integrity of the organisation requires right kind of leadership. Ensuring the quality of leadership is a crucial responsibility of the boards. This requires much more than choosing or evaluating the CEO or succession planning which are some of the well- recognised functions of the board. The board must pay equal attention to ensure that people with right competence and character are in leadership positions in every vital function of the organisations, like for example finance or marketing, and management is taking the right steps to groom the future leaders. This brings us to the question how to do this task of monitoring the integrity of the company? It cannot be done by sitting in the board room and talking about it. The directors must interact with every member of the executive team. They have to make uninformed visits to the work-places of the company from time to time and talks with the managers and employees. So, the ultimate responsibility for monitoring the integrity of the organisation lies in the Board of Directors. And to fulfill such a responsibility requires a Board of wisdom, character and competence. A human group can only be as good as its members. If a board has to become a source of character, wisdom and competence to management, its members have to possess these qualities. How to create such a board and who can do it? The board is the apex of leadership in a company and therefore it cannot look up to something above itself. Any change or transformation in the board has to come from within itself through self-analysis, self- governance and self-transformation. The board has to form itself into a close-knit team and arrive at commonly accepted standards for choosing its members and defining their roles, responsibilities and tasks. The best boards try to do this by conducting a thorough analysis of the competencies required for high-quality board leadership and matching them with corresponding roles. Here is an example from Continental Airlines. The board of Continental Airlines thoroughly analyzed the company’s business issues to determine what skills and experience it needed. Directors zeroed in on knowledge of the airline and travel industries, an understanding of marketing and consumer behavior, access to key business and political contacts, and experience with industry reconfiguration. In assessing directors, professional knowledge, experience and skill have to be an important factor. Some of the surveys list the following parameters which are useful for assessing the competencies of directors and matching them with appropriate responsibilities and roles. Holistic perspective which means the ability to view each thing as part of a larger whole, in relations with other things and with the whole. Holistic decision-making which means the ability to assess the immediate and long term consequences of decision for the people, organisation or the society. Insight into future possibilities, unmet needs and unmanifest potentialities. Sensitivity to higher values like truth, beauty and goodness and the ability to internalize them into one’s own self and implement them in the outer life. Ability to judge the character, competence and the hidden potentialities of people. Dynamic intuition into the underlying or hidden patterns behind the changing facts, appearances and events of life. Someone who governs her lower self-made of her physical, sensational and emotional being by her higher nature made of her rational, ethical and aesthetic being. Inner strength made of firm will, persistence and courage in living and upholding her values, ideals or principles under all circumstances and against all opposition, difficulties and obstacles. Such individuals with wisdom or character may be difficult to find in the corporate world. But they need not be necessarily from business. They can be from spirituality, art, civil society, literature, philosophy, science, public administration. In fact two or three individuals in the board from outside the corporate world give a multidisciplinary orientation to the board and brings a multi-angled perspective to decision making. 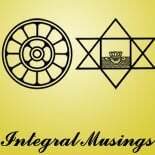 This entry was posted on August 24, 2016 by integralmusings in Integral Management.